Now fully updated in 2019! 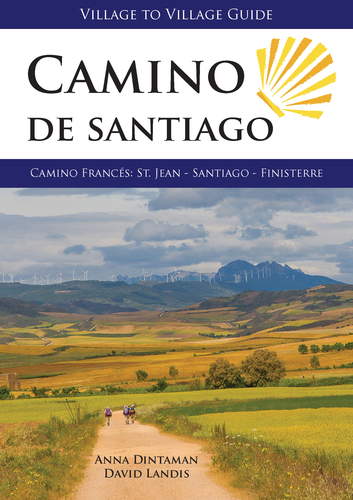 This Village to Village Guide to the Camino de Santiago is a comprehensive guidebook to walking the Way of Saint James, from Saint-Jean-Pied-de-Port to Santiago de Compostela (the Camino Frances), and also the Camino Finisterre to Muxia and Finisterre. This Camino guidebook includes full-color detailed topographical stage maps of each day's walk with free GPS files online; 135 detailed stage, city and town maps (now easier to read); essential practical information on transport, accommodations and services. It includes detailed listings of pilgrim hostels (albergues) and private accommodations in each town, including prices, amenities, number of beds, contact information, open dates, and more. There are regional introductions to the different areas along the Camino including information about traditional foods, flora and fauna, and local culture plus overviews of dozens of medieval pilgrim sites, with information about the historical context of the pilgrimage. All the information you need to embark on this epic pilgrimage walk in a lightweight, attractive book.